Note: I don’t review substandard books. I read a lot, but I don’t have a lot of time to review books. What I share, I share because it’s the best of the best. The most useful and interesting accounting book you’ll ever read. Tags: Accounting, finances, bookkeeping, entrepreneurship, small business, big business. Here’s the transformational message of the book, which almost every entrepreneur I know will be able to relate to immediately–the normal way to run a business is to take your revenue, spend what you have to in order to run your business, and then what’s left over is your profit. 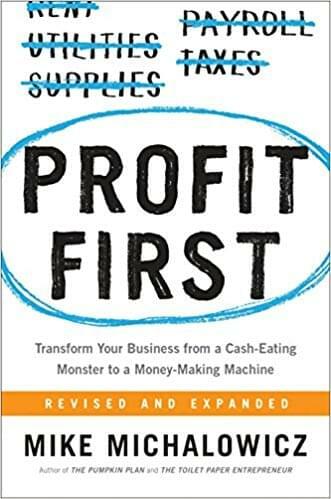 Profit First flips that and says take your profit out first, then run your business with what’s left. Yeah, that’s right, you choose what your profit is going to be. Want a profit margin of 10%? Set it at 10%, and you’ve got it. How about 50%? Go for it. Sure, there are consequences to choosing your profit first and it’s not as easy as choosing anything you want, especially if your business is already up and running. You might need to start at 1% and work your way up. And if you choose 50% for your profit it may not work with the realities of your business model. But how many of us run businesses for years and never really make a profit? I’ve been there. Profit First was so good I read it twice in a row, then sent a copy to every member of my management team. We all agreed we needed to make a transition plan immediately. We implemented it (with some starts and stops, it’s not always as easy as you’d like), and to the extent we’ve stuck to it the results have been amazing.